Made by Joel shares his Paper City trick-or-treat scene (shown above). Print it out from the site’s template on recycled paper for instant fun. Ohdeedoh wows us with 5 ideas for upcycling a changing table. Planning a Halloween party for the kiddos? Check our Hostess with the Mostess’ polka dot take on a trick-or-treat party. Built by Kids shows us how to make some pretty spooky Wicked Witch and Grim Reaper silhouettes that would look perfect next to your upcycled tombstone Halloween decorations. Have an old book? Turn it into a pumpkin…an eco-friendly pumpkin centerpiece that is…with JustMommies’ help. 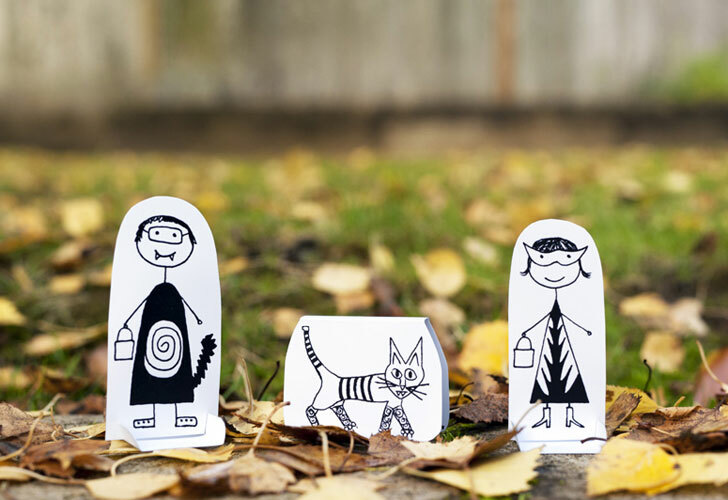 Made by Joel shares his Paper City trick-or-treat scene (shown above). Print it out from the site's template on recycled paper for instant fun.